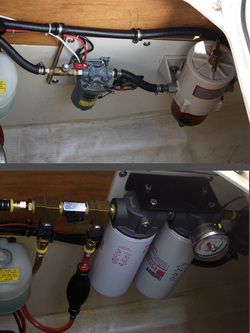 Fuel filter system. As they say, problems with diesel engines can be traced to one of three things – fuel, fuel, or fuel. Originally, I wanted a system that allowed me to switch filters on the fly in case it became clogged. I really wanted a Filter Boss system, but I also didn’t want to spend the money. On Adagio I had installed a dual Racor system (75/500FGX), which also allows for filter switches with the engine running, but without the bells and whistles of the Filter Boss. However, after I bought the Filter Boss for Indigo, I couldn’t find a good spot to install it. The filter module and handle sticks out too far into the engine compartment, severely limiting my ability to get down into the compartment to do other maintenance. I sold the new Boss and decided to just build my own system using two Racors and a few fuel valves. While searching the internet for ideas, I came across a good article on Seaboard Marine’s website – (http://www.sbmar.com). They specialize in commercial diesel maintenance and repowers. In a nutshell, they advocate multi-stage filtering (http://www.sbmar.com/articles/marine_fuel_filtration_-_the_seaboard_way/). Newer diesels with “common rail” injector systems are especially vulnerable to dirty fuel. Water, in particular, can cause catastrophic results with huge repair bills if even tiny amounts are allowed to make it into the injectors. After talking to Tony at Seaboard Marine I was convinced that this was the way to go. First, he told me this was serious overkill for a 40hp engine unless I suspected I would be getting dirty fuel (his normal cliental are commercial vessels with hundreds of hp and go through hundreds of gallons of fuel per day). I’ve read too many stories about cruisers getting questionable fuel in foreign ports, and Tony agreed that this system should eliminate that concern. Second, he suggested that I enlarge my tank pick-up and hose from 5/16 inch to 3/8 inch to allow gunk to get to the fuel filters – that’s their job after all. Having a good (or any) filter system will do no good if the tank pick-up clogs before it even gets to the filter. 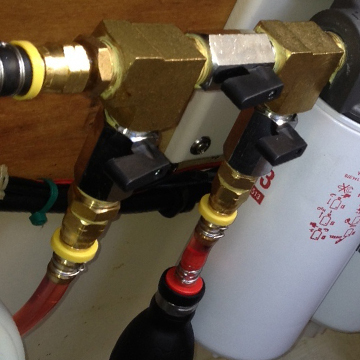 If that happens, you have to try to find and clear the clog somewhere between the tank and the filter – not an easy or quick job (I found more than a couple instances of this happening on various cruiser blogs and forums leading owners to install fuel polishing systems). So, it is much better to let the fuel filter clog, where it can be easily remedied. With a multistage system the second or “fine” filter gets out the small stuff but needs to be replaced much less than the “bulk” filter, reducing the amount of spare filters I need to keep on hand. I was still thinking about installing a bypass valve to my existing Racor in case the system clogged, but Tony said that the increased complexity was not necessary. The system includes a pressure gauge that measures resistance in the fuel system – an increase in system pressure will indicate an impending clog. He said you will start to see the gauge increase days before the filters actually clog. While you can’t change filters with the system running, you should have adequate warning before finding yourself in a dicey situation with clogging filters. The gauge also has a drag pointer, so you can see the peak pressure on the system even after the engine has been shut down. Additionally, the spin on filters are much easier to swap out than the Racor cartridge filters – You don’t have to screw around with the T-handle, cover, multiple O-rings and sloshing fuel. Now, I unscrew the old, screw on the new, bleed the system and done. Lastly, unlike a Racor filter module, the Seaboard system never needs to be taken apart and cleaned, which if you haven’t cleaned one is a real pain. Initially, I was concerned that the filters did not have a see through bowl. But, I realized my current Racor clear bowl is mostly useless unless I hang upside down and shine a flashlight on it, which I don’t. I occasionally drain a little fuel out of the Racor into a clear jar to check for water contamination. So this would be no different with the new Seaboard system, since the spin-on filters do not have a see-through bowl, but are equipped with a drain valve on each filter. Anyway, this is how we do it in the military aviation world. Every morning, our mechanics go out with a clear glass mason jar and take a fuel sample from every helicopter tank (two per helicopter), by draining a little fuel from each tank into the jar. What about Racor’s centrifical flow water removal design? Isn’t it better than water absorbing media in a spin-on filter? I don’t know, but if the commercial world trusts these spin-on filters for their million dollar machines, than I believe my little Yanmar is in good hands. Is it overkill? Yup. But I also have peace of mind. My only concern was the availability of fuel filters in other parts of the world, but this filter system uses common diesel filters found on heavy equipment throughout the world. Since these filter elements are much bigger, they also clog much slower, significantly extending the time between needed filter changes, and reducing the number of needed spares. That said, I’ll carry what I think is a two year supply of filters. Installation: the job took about 5 days with many stops and starts to get additional supplies. Overall, it went fairly straight forward. First, I pumped the tank dry in order to pull up the tank to inspect underneath and get easier access to the tank pickup. I removed the fuel line from the engine lift pump and used the electric fuel pump to pump the tank dry into 5 gal fuel cans. Since I was pumping the fuel through my Racor filter I also polished the fuel in the process. After pumping 3 gals the fuel pump died. I had ordered a new pump anyway and hooked it up to continue pumping. After spending an hour or so getting the old pump out and the new one in, I threw the switch and…nothing. I checked the fuse, again, and it looked fine. Out comes the volt meter, which checked 12 volts to the fuse but not out of the fuse. Check the resistance to the fuse and it checked OK. Then I realized that there was a little corrosion on the fuse block where the fuse makes contact. After cleaning the contacts, the pump fired up. Back in the game. The filter looked really clean and the pickup screen was spotless, which made me feel better. Pacific Seacraft aluminum tanks are known to corrode underneath where they make contact with the stainless steel keel bolts in the bilge, so I wanted to take a look underneath. I was glad to see that the tank looked brand new. About 7 years ago, Jay had removed the tank and had it epoxy coated, painted, and added some PVC mounts to keep the tank off of the bolts. It worked perfectly. Thanks Jay. After removing the old lines and filter, I mocked up a mounting board and found the best location for the filter. After some adjustments to the mockup, I remade the mounting board in Starboard and remounted it. I replaced the tank to filter hose with a larger 3/8 hose. I also replaced the hose from the filter to engine lift pump but did not change the 5/16 diameter, because I don’t need increased flow and the fuel is clean coming from the filters. Besides, the engine lift barb is 5/16 and cannot be changed. Overall, I like the installation placement and look. The module is very robust and put together well. I was also impressed that Seaboard used Tef-Gel on the mounting plate and mounting bolts where it made contact to the aluminum filter modules. It is heavy duty and I can still wedge myself down into the engine compartment. 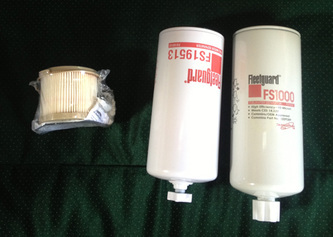 The Racor filter (left) will clog 3X faster and not filter as well as the Fleetguard filters (right), due to the increased filter surface area. Drains on the Fleetguards allow for fuel sampling to check for water.